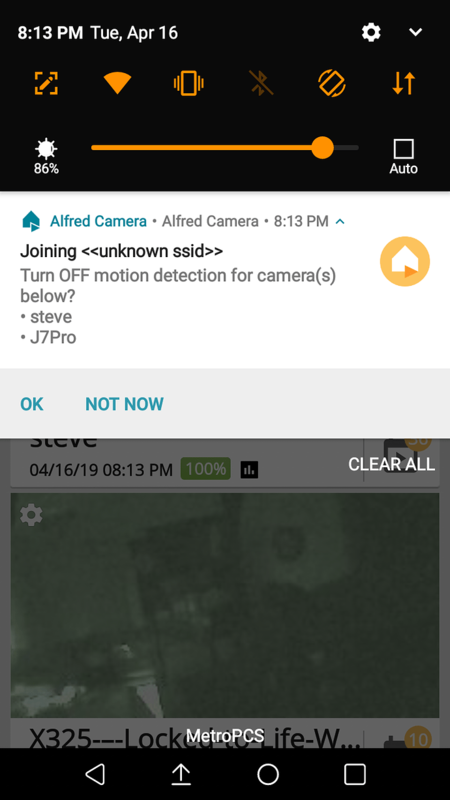 Im getting notifications saying.....joining unknown <ssid>....WHAT DOES THAT MEAN...and it also tells me to turn off motion detection on my cameras - Got a Question - Alfred Center | get the most out of the best home security app! Thanks for reporting the issue. The notification you received is triggered by Motion Detection Reminder. It reminds you if you want to turn off Motion Detection when your Viewer and Camera phone are under same WiFi. It seems that the message was written in a wrong format now. Would you please provide a screenshot of what you see? Almost sounds as if your connecting to an OPEN network SSID called “unknown ssid”, you should be connected to your own WiFi SSID. and all the characters are SMALL case, which makes me think its someone labeled their WiFi “unknown ssid” and has not put security enable login. unknown to me also could refer too HIDDEN network SSID maybe. Im going with someone labeled their WiFi as mentioned and its OPEN. What is the name of your WiFi SSID anyways?